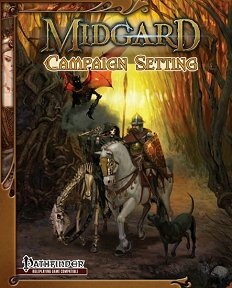 Publisher's blurb: "The Midgard Campaign Setting brings to life a dark world of deep magic, with seven regions flavored by the folklore of Central and Eastern Europe plus a heady dose of weird fantasy. Lead designers Wolfgang Baur, Jeff Grubb and Brandon Hodge led the Open Design community in a two-year project to build a sprawling setting supported by adventures and sourcebooks compatible with the Pathfinder Roleplaying Game, Dungeons & Dragons, AGE System, and more. "Midgard is ley line magic and warped alchemical experiments; the Western Waste's giant, shambling horrors and magic-blasted landscapes; diabolical gnomes and the schemes of immortal Baba Yaga; wild, wind-riding elves and swashbuckling minotaur corsairs; the Mharoti Empire's lethal assassins and exotic splendors; and the dragon-haunted crags of the icy Northlands."